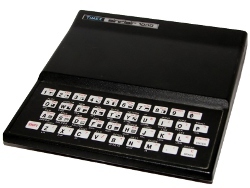 Not everything I wrote on the ZX81 was a game, although I did write a lot of those. In fact, some of my first computer programs did nothing more than print pictures. 3D Image, a badly named program, is one of my experiments in animation on the ZX81. Depicting a sun at the end of its life, its an uses simple math to generate an image. As hinted by my comment, there isnt any 3D images in the program. Not sure what I was thinking. Everything about the sun is 2D. Heck, its even square. Thats not too surprising given the ZX81s blocky graphics. But, I could have tried at least a little bit. Im sure I was aiming for something more, but the result is not 3D. Enlarger, showcased in February of 2013, better represents a 3D image, if only just. At least the object presented looked round. Even so, 3D Image tells a story, which is more than Enlarger does. Perhaps not the happiest of stories, but it adds a little flare to an otherwise simple program. The text is what makes the experiment more interesting. Without the story, the program is just a square changing size. Using a simple explanation, 3D Image engages your imagination and gives you a reason to watch. Simple code for simple shows. The sun, as well as the explosion, is just a couple of loops. The variable A presents each frame of the animation. There is then another loop that determine the X axis of the object. It is a simple calculation, dividing A in half and subtracting and adding values to it to center the sun as it changes. The Y axis, which is static, is calculated in the print statement itself. Similar to X, it divides A by 2, but it only calculates the beginning of the line. Lastly, sun is calculated using a string slice based on the value of A.
Thats wordy, so below youll find the actual code. Straight forward enough, but the math could have been tightened up a bit. As written, though, I could position the sun elsewhere if desired. The rest of the code isnt my best. First, it duplicates a lot. The routine for the sun collapsing and exploding are almost exactly the same. Using some variables and GOSUB, I could have represented both with a single function. Doing so would have shrunk this already short program in half. Another negative is that I ended up using the ZX81s FAST command to quickly update the image. 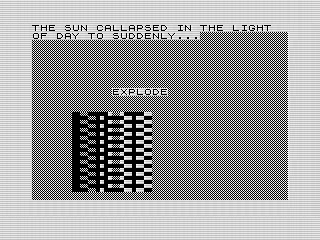 This has the effect of causing the screen to flicker on a real ZX81. Not very pleasing. I should have avoided it by looking for other ways to improve the speed. Although 3D image doesnt live up to its name, it is still a success. Experimentation is how we learn, and this is a window looking back at my adventures in programming. Perhaps it isnt flash and the code is repetitive, but it works. That, ultimately, is what is important.